to listen to patients and recognise their concerns. I support patients and their families from pre-diagnosis and diagnosis right through until after treatment. Working as part of a multidisciplinary breast team, I give the results to patients diagnosed with breast cancer and explain the treatment plan. I often think of my role as a translator of complex technical language into words that are much easier to understand. Often patients are more open to discussing how they are feeling and asking questions with a nurse than with a doctor. I started my training in August 1975 at Leeds General Infirmary. I had posts in Leeds, Pendle and Grampian before moving to Lancashire in 2001 and taking up my senior nursing post in cancer care. How did you come to work in this field? As a district nurse, I was involved in the care of patients with cancer and their families, an aspect of the role I really found fulfilling. When we moved up to Scotland, I was working in a cottage hospital in Turriff when a new post came up for a Macmillan palliative care clinical nurse specialist. As I was pregnant with my first child, I thought I couldn’t apply until I talked it through with my manager who encouraged me to apply for the post. I went for my interview on the Wednesday and had Katy on the Friday night/Saturday morning. The interview panel helped me to feel relaxed – they had a delivery pack ready on the table! The skills I acquired in this setting transferred to my current post as a Macmillan breast care specialist nurse. 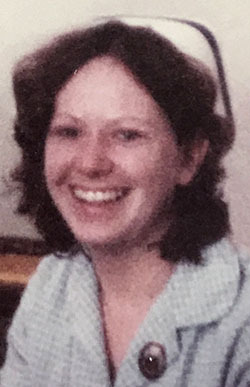 Carol Brearley as a nursing student. I have always wanted to be a nurse ever since I was a little girl. My mother Ruth Rattigan was a nurse and she trained before the NHS came into existence. My mum trained in Woolwich during the second world war and worked all over the country as a nurse over a 40-year period. She finished working as a night sister in Halifax. My mum seemed to know so much about nursing and medical conditions and treatments. As a little girl, I used to love to go to meet her from work and wait while she changed out of her nurse’s uniform. She was very proud when I got into Leeds General Infirmary to do my nurse training and said it was like old times when she came to see me in the nurses’ home. It is such a privilege to be in a senior nursing position and still have so much contact with patients. I have done follow-up clinics for many years now, which I particularly enjoy. It’s great to offer continuity to patients and I think they appreciate it too. What qualities do you think a cancer nurse should possess? I think every cancer nurse should have empathy and communication skills above all else. The ability to listen to patients and recognise their concerns is essential. We also need to realise that we don’t have all the answers and it’s okay to say so. We must not be afraid to ask what we do not know, nor should we be afraid of being the patients’ advocate. Outside of work I volunteer for the Samaritans, which I also find fulfilling. On a lighter note, I help run – and act and sing – in Stagestruck, a voluntary theatre group that encourages children and young people to participate in live theatre. Our next production will be Pinocchio, which will be at Lancaster Grand Theatre in February. How has nursing changed during your 40-year career? I remember working on a surgical ward as a nursing student when patients would come in for laparotomies. Sometimes they would do ‘open and close’, when the cancer was clearly advanced. Nobody would talk about cancer, and the patients would be put on ‘mist euphoria’ to manage the pain. Many of the nurses would avoid talking to patients in case they asked questions about their diagnosis. Besides the better technology leading to earlier diagnosis, the communication about cancer has improved tremendously. We are far more open about cancer and its treatment. I hope this has led to a reduction in the fear and stigma about cancer that was very apparent in 1975 when I started nursing. There have been many changes in nurse education over the years. We were trained at schools of nursing with much of our learning taking place on the wards where we were included as members of the team following an initial six-week introductory block. We weren’t allowed to do nights on our first ward where we stayed for three months, but from then on we did a week of nights as the rota required. 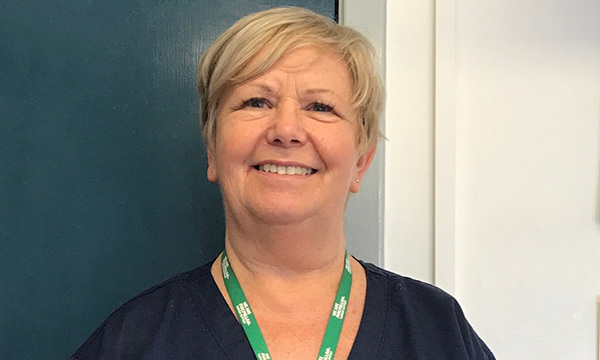 It was usually both a junior and a senior nursing student who worked nights – there were no trained staff on other than the night sister who would come and do a ward round and was available if there was anything unexpected happening (for instance, a cardiac arrest). On reflection, I think we were very young to have the responsibility of caring for a ward, but at the time we just accepted it. I believe today’s nurses are taught to be critical thinkers which is valuable in encouraging innovation and positive change. The NHS is a phenomenal service. It’s not perfect but it’s a great organisation. It will only survive in the 21st century by people believing in it and being prepared to work in it.